Salford Mennonite Child Care Centers » Employment » Imagine. Play. Learn. Since 1984. Full Toddler Teachers needed at the Harleysville location. Early Childhood Education degree is preferred. 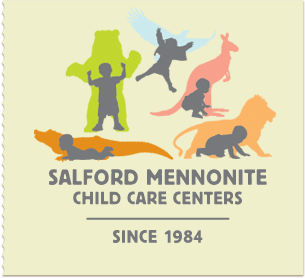 Salford Mennonite Child Care Centers is a ministry of Salford Mennonite Church operating at two locations. The church center, established in 1984, is located at the church in Harleysville, Pennsylvania. A second center was added in 1999, at the Dock Woods Community, a retirement community in Towamencin Township, where intentional intergenerational experiences are incorporated into the program. Both centers are accredited by the National Association for the Education of Young Children (NAEYC). At both locations a “home away from home” is provided for children of working parents living in the surrounding communities. Teaching teams design developmentally appropriate curriculum, incorporating physical, cognitive, social, emotional, and spiritual developmental criteria. Children learn through age-appropriate, quality play experiences. Classroom sounds are happy laughter, busy activity, and pleasant conversations. You can also check out our website at www.salfordmccc.org for more information. If you are interested in a stimulating work environment where creativity & personal growth is valued, you will enjoy being a member of the SMCCC family.